TOASTED maple pecan, burnt caramel, cookies and cream and bambino are some of the flavours residents and visitors can steal a lick of this summer as a new ice cream and coffee parlour opens at the East Shores precinct. Gelaspresso will open on Sunday, and the timing couldn't be better, with temperatures forecast in the 30s and school holidays not far away. 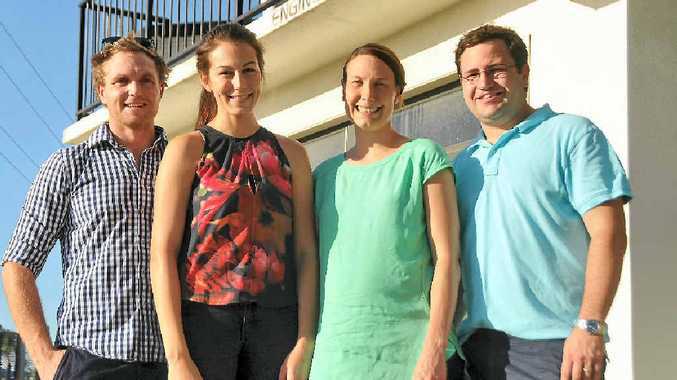 The four entrepreneurs - Heidi Hastings, Jeremy Hastings, Sam Hill and Julia Imarisio - will bring more than 30 flavours of gelato to their shop. The recipe comes from a Brisbane-based gelato family with four generations in the business. "We have room for 24 varieties in the freezer," Mrs Hastings said. "And (we've got) the possibility to make our own flavour if we get good feedback." In an article in The Observer on November 8, Gladstone Ports Corporation CEO Craig Doyle said East Shores would not be developing a permanent cafe until stage two of the development. The business partners saw the opportunity. "The stars have aligned for it to come together quickly," Mrs Hastings said. "It's been full steam ahead since we got the lease a week ago. "The Gladstone community should be really excited about (this)." Gelaspresso will be open from 7am on Sunday at 17 Flinders Parade.